Every hunter enjoys hunting for a different reason. For me, it's all about the story. Waiting for a buck, seeing the buck, then shooting the deer just isn't enough for me. I find it necessary seek out my bucks instead of sitting and waiting. Whether its tracking in the snow or still hunting when the ground is bare, I have to be on the move searching for a buck I want to kill. The story always begins as I leave the truck. Anything can happen from then until the time I finally put down the buck. This story is no different and it begins with my choice of where to start my hunt, and why. Late season muzzloader is my favorite time to hunt. The chance of having snow is usually higher, the amount of hunters in the woods is at its lowest, and the challenge of taking a buck with my 50 caliber "Hawken", with patch and round ball, is far more exciting. 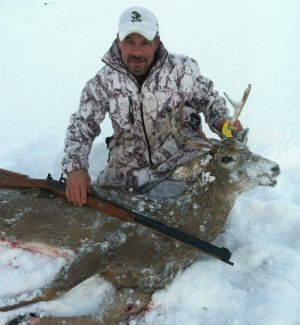 The plan today was to take my biggest muzzleloader buck ever. I've killed plenty of big bucks, but somehow luck has never been with me when it comes to taking a decent buck with my Hawken. Believe me, it hasn't been for lack of opportunity... I've had many chances. On my first muzzleloader hunt ever I had a beautiful big racked buck running right at me while I waited for him to get to with twenty yards. Being a green-horn with the smoke pole, at the moment of the shot I pulled the set trigger instead of the fire trigger... it doesn't take a rocket scientist to guess I didn't get that buck. The next was an even bigger buck, maybe 140 class, that I grunted to within 15 yards in a swamp... cap went off, but the gun didn't. Bedded 120 class... capped again. A friend summed it up nicely upon hearing the story of the first missed opportunity. He just looked at me and said, " Welcome to muzzleloading." I started this hunt like always by hunting into the wind looking for a track to follow. An early morning snowfall covered most of the tracks from during the night so if I found a track, it would most likely be fresh. I headed down a trail towards an area I know buck like to bed when the snow starts getting deeper. I got off the trail to creep through an old orchard that boardered a deep ravine before coming to the bedding area. I wasn't seeing any tracks so I was really taking the time to scan the whole landscape in hope of seeing a piece of a deer laying down. As I popped out of the orchard just below the bedding area, which rested on a small flat at he bottom of a very steep hill, I stopped and looked over the blow-down riddled bedding spot for a couple minutes looking for a bedded buck. I didn't see anything so I stepped on to the trail and proceeded again into the wind up the trail parralelling the bedding area. I make it a point to wear my white camo when the snow hits the ground. I have had deer look right through me standing only several yards away while wearing it. It allows me to get away with a bit more movement without getting picked off, especially at longer distances from a deer. As I began to reach the end of the blow-down area I hadn't seen anything of interest and drifted off for a second in thought of my next plan of attack. Suddenly, something caught my eye. I stopped and took a slow step backwards to get a clear look at what had gotten my attention. I nearly walked right by a buck bedded about thirty or so yards away. He was just getting up as I focused in on him, got the gun cocked, put it to my shoulder and set my eye behind the peep sight. He had no idea I was there, but was just getting up I guess to stretch his legs. I put the sight on his shoulder and squeezed the trigger. The gun went off, but hang-fired catching me a bit by surprise. The buck whirled and started running right at me, having no idea what direction the shot had come from. I stood there thinking, " Just my luck, he's running right at me and I can't shoot him because the gun isn't loaded." He was on me so quickly I had to jump aside pushing my gun out in front of me to avoid being run over. As he went by I could see his front left leg swinging around in circles. I must have dropped the barrel a bit with the hangfire and hit him high in the leg, breaking it. I was disgusted with myself for having not made a good shot, as I watched him go past me, fall once in his haste and then leap over the edge of the deep ravine. I scrambled for another load from my pocket and took my time taking care to reload the muzzleloader without spilling any powder or getting it wet. I snapped on a cap and headed for the edge of the ravine. I looked over the edge knowing that there was only one option, to get on his track and try and catch him before dark. I was determined that I would follow him no matter where or how far he took me. This ravine is very intimidating not just because of its depth, but because the terrain is tough to navigate. Rock walls, steep slopes, thick woods, swampy areas etc. I wasn't even sure how I would get the buck out if I killed him in the ravine. I was already a mile from my truck and he was taking me even deeper into the woods. Over the edge I went and, with a bit of difficulty, down the hill to the edge of the creek. I was relieved to see that his track didn't go across the creek, but instead he stayed along the edge. I could see he wasn't having a good time of it on three legs, hitting the ground several times while changing direction to avoid obsticles. I followed the track for about thirty minutes before he slowed down to a walk, noticing he was still having trouble. There was small amounts of blood the whole way and a bit more now that he had slowed down. The tracks took me to a part of the creek that had been slowed down by a small beaver dam that created a shallow flooded area covered mostly by snow, ice and goldenrod. I scanned the area for the buck, but before I could get my eyes focused on the entire flow, the buck jumped up a ways in front of me. The shot was just too far to take a chance of burning up one of only two loads I had left. So, I just watched as he jumped to the other side of the creek and surprisingly ran up the steep slope on the other side. I was dreading how deep and how far he was taking me into the ravine and away from any easy way to get him out. But, I found a place to cross the creek and up the hill I went after him. Once I made the top of the hill it flattened out a bit and I could see his track disappear into a tangled mess of saplings that went up hill even more. Off I went, making my way through the saplings, unable to be very quite with all the sticks in the way. Sure enough at the top of the hill I found a bed with blood in it where he had stopped until he heard me coming. His tracks ran off downhill this time into a dense hemlock stand. I slipped and slided my way down the hill onto the flat of the hemlock woods, where I could see a much longer distance. 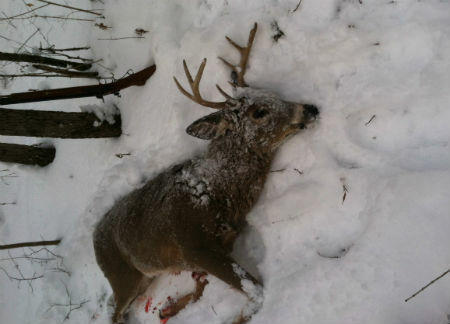 I looked again for the buck then proceeded on the track, coming to another bloodied bed next to a big hemlock tree near the creek. To my disappointment the track led back again across the creek and up another steep hill. After I made it up the hill, an hour had elapsed since the first shot at this buck and he still seemed to be able keep just out of reach. Although, he did seem to be pumping out a bit more blood from the leg wound everytime I pushed him from his bed. I was thinking now that I had about three hours until dark, so I decided to slow way down and give him some time to settle in at his next bedding and maybe catch him before he saw or heard me. I didn't travel another fifteen minutes before hearing him jump up in a small thicket and he was off and running again. The fact that he had bedded down so quickly though told me that this little chase and the loss of blood was starting to take it's toll on him. So instead of going slow I started pushing him harder, not letting him slow down for too long. Sure enough I could see him starting to fall down every once in a while, so I pressed him harder. He took me up another hill to my surprise, and although he made it up ahead of me I could see where he was almost dragging himself up the hill. At the top of the hill his track led up a tractor path bordered on both side by pine trees. At the end of the pines I saw another bloody bed and tracks leading into another dense stand of young hardwood saplings about twenty yards from the bed. I entered the saplings and heard him get up again just fifteen or so yards away, but couldn't see him. I ran trying to cut him off, but the saplings were too close to go very fast. I stopped and listened. Again, crashing only a few yards from me... he was having trouble staying on his feet. I moved as quickly as I could towards the sound of him crashing through the trees. The saplings thinned out where I could see a field that opened up about twenty-five yard in front of me and, sure enough, I saw him get up and run... only to fall again after a few steps. This time he didn't even try to get up right away until I made a mad dash to get an opening where I could take a shot. He made it to a rise in the field near the wood edge, slipping just over the top out of sight. I walked slowly over the top expecting him to be on the other side, but could only see where his tracks led to the woods. I ran to the woods just in time to see him fall again about twenty yards away. He was breathing so hard his mouth was hung open and his tongue was sticking out. I quickly raised the gun and fired putting him down for good. I was so tired I didn't even go up to him right away. I fell to my knees in exhaustion just wanting to relax a minute after the hour and a half trek. Suddenly it dawned on me that this wasn't the end of the story. After dressing him and strapping the drag rope over my shoulders I knew there was nearly a two mile drag back to my truck with nobody around that I could call that would be able to find me to help. Two and a half hours later, and just before dark, I was back at the truck sweating like a pig and looking like I had gotten pulled through a knot hole backwards. Yet, still able to smile from ear to ear with satisfaction that at 54 I am still able to pull off a hunt like this and... yes... have a great story to share as well.